During January 2002 a salvage excavation was conducted in Caesarea, Neighborhood 2 (Permit No. A-3553*; map ref. NIG 19090–5/71290–305; OIG 14090–5/21290–305; Fig. 1), in the wake of damage to antiquities caused during the building of a house. 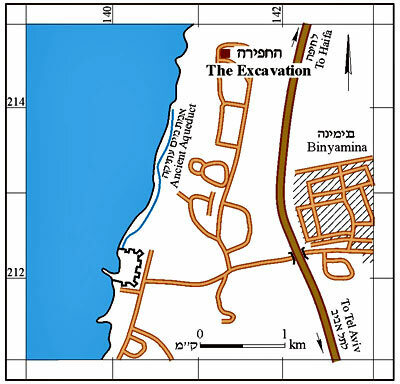 The excavation, on behalf of the Antiquities Authority, was directed by R. Avner, with the assistance of P. Gandelman (pottery), J. Porath (scientific guidance), V. Essman and V. Pirsky (surveying), T. Sagiv (field photography), J. Bukengolts (pottery restoration), H. Biton (pottery drawing) and K. Marks (University of London). A northern and a southern area were opened, revealing eight cist graves (one is questionable) and four stone sarcophagi. (20 × 21 m; Fig. 2). 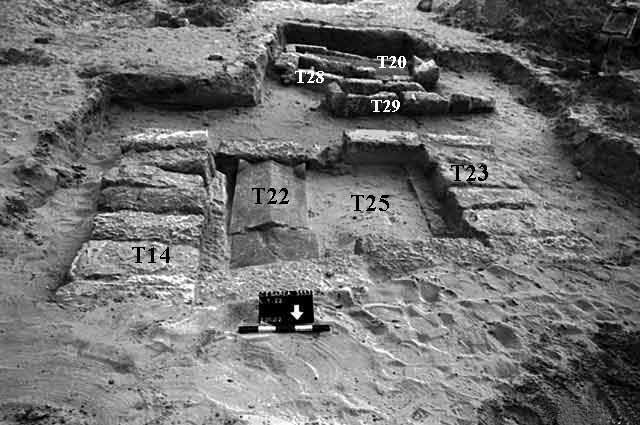 Five cist graves were discovered; four (T5, T6, T8, T10) were oriented east–west and one (T9)––north–south. The three western tombs (T8, T9, T10) were covered with stone slabs; T8 and T10 were identical and covered with five slabs (0.8 × 2.2 m). 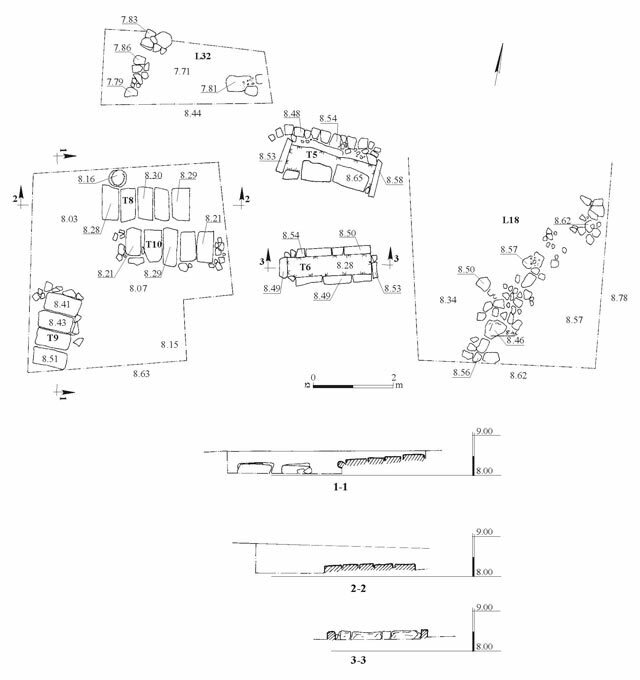 Tomb 9 extended beyond the limits of the excavation, hence its entire length was not exposed; four of its covering slabs were revealed (total length 1.8 m, width 0.85 m). The two eastern tombs (T5––0.85 × 2.50 m; T6––0.90 × 2.25 m), built of kurkar slabs, had no covering slabs and were not associated with any finds. (6.0 × 8.5 m; Figs. 3–5). Eight tombs were discovered. Tomb 27 is a stone sarcophagus (0.60 × 1.35 m) covered with four ceramic roof tiles (average dimensions 0.3 × 0.6 m; average thickness 3.5 cm). The roof tiles partially overlapped each other and only the eastern tile was completely visible. It seems that stone slabs were placed around the sarcophagus to form a modest frame for the tomb; one of the stones was preserved in the east and two remained in the north. A two-cell structure of kurkar slabs (average size 0.18 × 0.70 m), set lengthwise and perpendicular to the soil, was built above the two north stones at a later phase. The stone sarcophagi T20 (0.56 × 1.90 m) and T28 (0.61 × 1.98 m), ascribed to the sarcophagi group known as ‘Samarian Coffins’, were placed in the cells (0.7 × 2.3 m; 0.67 × 2.10 m). The sarcophagi were laid in an east–west direction, similar to Sarcophagus T27. A large stone (0.4 × 0.7 m) was incorporated in the eastern side of Cell T28 and a similar stone (0.45 × 0.60 m) appeared in the western part of the frame that surrounded the sarcophagi, perhaps evidence of family ties between the deceased interred in the two sarcophagi. North of them was a cist grave (T29; 0.60 × 2.25 m), oriented southwest–northeast, without covering slabs. It was built of stone slabs similar to the frame around Sarcophagus T28. 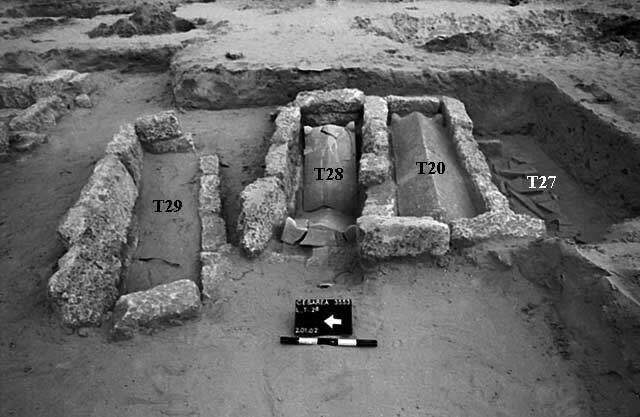 Some 2.5 m north of T29, four tombs (T14, T22, T23, T25) next to each other in a row, oriented north–south, were discovered. The two lateral tombs, T23 (0.9 × c. 2.5 m) and T14 (0.85 × 2.68 m), were cist graves covered with stone slabs––six on T23 and seven on T14. 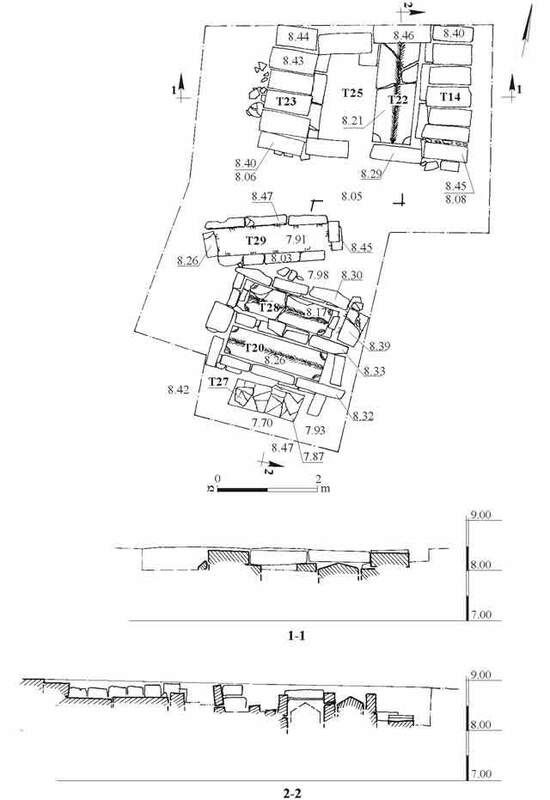 The two inner tombs were T22, a stone sarcophagus that was not exposed for its entire length (0.75 × 2.00 m at least) and T25, which may not have contained a sarcophagus next to T22 (similar to T28 and T20) or may have possibly been a cist grave whose covering slabs were not preserved. Tombs T22 and T25 were probably covered with stone slabs, although only the slabs at their ends were preserved. However, it is possible that these slabs belonged to cist graves, originally situated at a higher level and not preserved.
. Although the tombs themselves were not excavated, pottery vessels were found near them; some were standing near the tombs and may have served as offerings or tombstones. Among the pottery vessels were imported ones, including a Terra Sigilatta bowl (Fig. 6:2) and krater (Fig. 6:4); amphorae (Fig. 7: 6, 11, 12) from North Africa, one of which (Fig. 7:12) has two holes (diam. c. 1.5 cm) that were drilled in antiquity and indicate that the vessel may have been used for libation in Tomb T22; an amphora (Fig. 7:7) whose provenance is southeast of the Black Sea and an amphora (Fig. 7:16) from Crete. The amphorae were probably brought to Caesarea as storage vessels that contained imported products and were put to secondary use in the cemeteries as gravestones. The ceramic finds are dated from the first–fourth centuries CE and indicate that the cemetery was active during the Roman period. The finds are described according to their proximity to the tombs, in an attempt to date independently each tomb.
. Near the southeastern corner of the tomb was an intact discus lamp (Fig. 7:17) from the first–second centuries CE. Another discus lamp (Fig. 7:19) was in the southern balk, next to the tomb. The filling holes in these lamps were broken, probably on purpose. Three amphora bases from the second–third centuries CE (Fig. 7:7) were discovered in the southern balk. One of the bases and the upper part of another amphora (Fig. 7:6) were imported from the region of the Black Sea. Therefore, T9 should probably be dated to the second–third centuries CE. and T10. The fill next to the eastern part of these tombs contained fragments of pottery vessels that dated to the first–fourth centuries CE, but can be assigned with certainty to any of the tombs. The vessels included a bowl (Fig. 6:4) from the end of the first–the beginning of the second century CE; a Terra Sigilatta krater (Fig. 6:5) from Cyprus, dating to the second century CE; cooking pots (Fig. 6:6, 7) from the first–beginning of the second century CE; baggy-shaped jars (Fig. 7:1) from the first–second centuries CE; an amphora (Fig. 7:4) from the second–fourth centuries CE and an amphora (Fig. 7:5) that was south of Tomb T10. Two lamp fragments were found; one came from the southwestern corner of Tomb T8 (Fig. 7:18), dating to the third–fourth centuries CE and the other was to the west, near Tomb T8 (Fig. 7:20), dating from the first–second centuries CE.
. An amphora rim (Fig. 7:15) from the second–fourth centuries CE was discovered in the fill of the tomb. T28. An amphora rim (Fig. 7:8), dating to the second–fourth centuries CE, was found in the fill above the sarcophagus. T20. The rim of a baggy-shaped jar (Fig. 7:2) from the first–second centuries CE and two amphora rims (Fig. 7:9, 10)––one dating to the second–third centuries CE and the other from the end of the first century to the beginning of the second century CE––were found in the fill over the sarcophagus. Although the dates of these finds range from the first–third centuries CE, they can probably be dated to the seond century CE. T27. 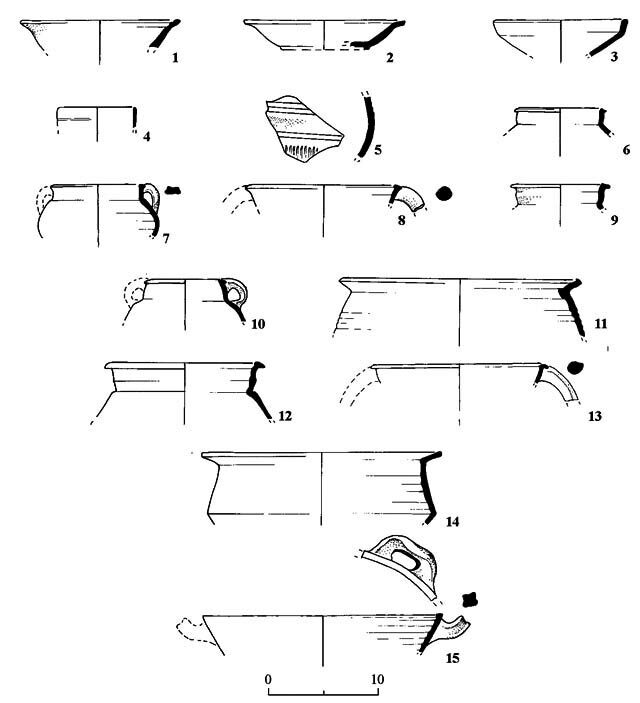 Fragments of three bowls (Fig. 6:1–3), dating to the second century CE were found in the fill, next to and south of the sarcophagus. The first two bowls were Eastern Terra Sigilatta and the third originated from Cyprus. A cooking pot (Fig. 6:8) from the third–fourth centuries CE also came from the fill. Since T27 predated Tombs T20 and T28, it seems that the cooking pot belonged to the later tombs and probably infiltrated the fill next to T27. It is proposed that T27 should be dated to the second century CE. T22. Two amphorae (Fig. 7:11, 12) imported from North Africa were found lying on the sloping western side of the gabled coffin lid. The fill nearby contained a baggy-shaped jar (Fig. 7:3) that is contemporary with the amphorae, which are dated to the second–fourth centuries CE, as well as a cooking pot (Fig. 6:9) from the third–fourth centuries CE. Thus, it can be assumed that the tomb dates to the second–fourth centuries CE. T25. Three cooking pots were discovered in the fill inside the tomb. The first (Fig. 6:10) is of the widespread type during the first century and the beginning of the second century CE. The second (Fig. 6:11) dates to the third–fourth centuries CE and the third (Fig. 6:12) is from the second–third centuries CE. A cooking krater (Fig. 6:15) is dated to the first–second centuries CE. An amphora (Fig. 7:13) dating to the second–fourth centuries CE was probably used as a tombstone. Two other amphorae (Fig. 7:14, 16) are from the second–third centuries CE; the one in Fig. 7:16 was imported from Crete. The precise date of this tomb is uncertain; it probably dates to the second–third centuries CE. T23. Two cooking pots (Fig. 6:13, 14) were found in the fill next to and west of the tomb. The first is dated to the third–fourth centuries CE and the second is from the second–third centuries CE. Therefore, the tomb should probably be dated to the third century CE. The cemetery at Caesarea was located outside the city limits, at a distance of c. 2 km from the city walls. It covered an extensive area and its boundaries are unclear. So far, no tombs that dated to the Hellenistic period were discovered. Next to the southern city wall, J. Porath excavated a mausoleum with a ‘nefesh’ that dated to the Early Roman period and burial caves, dating to the Late Roman and Byzantine periods. The tombs discovered in the excavations indicate that activity in the vicinity of the necropolis in Caesarea was from the first century through the fourth century CE. The two kinds of burials were cist graves and stone sarcophagi. The sarcophagi were enclosed within stone slabs that were arranged around them. The upper part of the sarcophagus was probably visible and memorial ceremonies were apparently conducted atop them, including the lighting of lamps, as evidenced by the lamps placed near Tomb T9, and libation, as evidenced by the holes in an amphora that was placed on Sarcophagus T22. The three amphora bases near Tomb T9 may be indicative of a similar custom. Even though the tombs in the northern area were not excavated, it is possible that the cist graves postdated the sarcophagi. 2. The southern area, plan and sections. 3. The northern area, plan and sections. 4. The northern area, looking east. 5. The northern area, looking south. 6. Bowls and cooking pots. 7. Jars, amphorae and lamps.